One of my goals to help me stay within the grocery budget is to cook more at home. Many of my recipes call for ingredients in weight instead of package size. That’s actually a good thing considering the shrinking of packaging, but I digress. When I was asked by EatSmart Products to try out their scale I was curious to see how it worked. 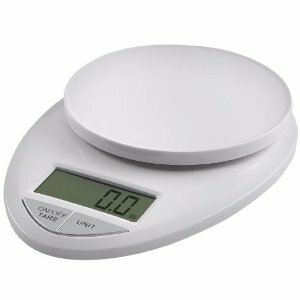 The Precision Pro kitchen scale, shown below, has a extra large LCD display and can weight items up to 11 pounds. It has the tare feature I demand and turns off automatically. I like that the food tray is not glass as it’s easier to clean. The design is compact yet large enough to hold a bowl of ingredients. The taring was easy to use as I first added the pasta and then pressed the tare button to add the next ingredient. I found that it weighed quite accurately and would recommend to any friend. This giveaway is open to those 18 or older and U.S. residents only. Entries close on October 26th at noon Pacific Time and the winner will be selected via And the Winner Is… plugin. If there is not a response within 48 hours to request for mailing address another winner will be selected. Remember to leave an email address that you’ll be checking. Thanks to EatSmart Products, this product is being given to the winner free of charge in exchange for hosting this giveaway on my site. The opinions are my own and not influenced in any way. What types of foods/ ingredients do you use this scale for? I am curious to know, because I don’t think I have ever had to weigh anything. Thanks for the post. Favorite healthy cooking tip for every ounce I reduce in meat (chicken, beef, pork, etc) I add an ounce of vegetables. @BruceBucks Baking recipes are supposed to be measured to be completely accurate. Since 1C of flour could fluctuate in weight by a lot! That is what I would use it for more than anything else. I do have another question though, I have been eyeing the food scale that the display pulls out, so you can see it when a large bowl is on top. Since this doesn’t have that, does it seem like an important feature at all? Did you have problems reading the display? My healthy tip is to use olive oil instead of butter in EVERYTHING! This be great, especially for foreign cookbooks which tend to use weight. My healthy cooking tip is to add pureed veggies to food likes spaghetti sauce, hamburger meet, scrambled eggs. It’s a great way to get a few more in. Tweeted and I already subscribe via RSS! My best healthy eating tip is definitely portion control. Don’t go by what the packaging says as that is more driven by making the product look better, go by national standards. There are all kinds of charts and graphs and lists on the Internet for what constitutes a correct portion. No matter how healthy the food is, eat too much of it and you do yourself no favor. By the way, I hate to expose my ignorance but what’s “taring” and “tare”? I Googled it and couldn’t come up with a definition that seemed to fit. Taring allows you to reset the scale to zero weight so you can accurately weigh the ingredients. So I put the bowl on the scale and then press tare to reset the weight to zero so it only will weigh the food. I try to replace ingredients for healthier ingredients or add in healthier ingredients to a recipe when I can. My favorite health tip is to use herbs, vinegar or salsa/chutneys instead of the regular salad dressings. Also to make an extra portion when I make my meal and freeze it, instead of buying frozen food. In baking breads, cakes, etc., I often use unsweetened apple sauce in place of some (up to 1/2) of the oil the recipe calls for. This greatly lowers the fat content. And it’s healthy. I subscribed via email. Thanks! Great Site! I re-tweeted Wealth Informatic tweet http://twitter.com/#!/WInformatics/status/27879067893 . Favorite healthy cooking tip – what about a non cooking tip? if you eat rawvegan than you are healthy already (high fiber, lots of veggies – totally uncooked). Well, you can heat it but no higher than 118 degrees or its can kill vital enzymes. I cut the salt in half , use lower-in-fat substitutes such as low fat cheese, salad dressing and evaporated skim milk. You know, my husband was trying to weigh some hamburger patties just the other week before he put them on the grill: he was trying for 1/4 pounders. And when we added up all the patties, their weight fell short of the marked weight on the meat packaging by a few ounces. We decided they must weigh the meat After they package it, and then don’t account for the packaging weight. That was news to us. Oh, tip? I guess it would be to cook with ingredients, but that’s a no-brainer. Let’s see… When we lived in Italy, I learned exactly How Much olive oil they toss in their pasta after it’s cooked. Olivie oil is so chock-full of good stuff; Americans would do well to use more of it in our cooking. Oh, I also subscribe via RSS. I “saute” veggies in chicken broth instead of oil or butter. Add cooked barley to raw hamburger. When you cook it you don’t notice it’s there. My tip is to read food labels carefully. It is amazing to see what unhealthy ingredients are hidden in food that you would never expect! My tip that helps me to eat and cook healthy is to keep fresh fruit and veggies cut up and cleaned so I can just toss them into what I am making. My healthy tip is that there is always cut-up fresh vegetables in our refrigerator. And they are in clear glass containers so no one can miss them when they want a snack. Bake, Broil, or Grill is the way to go! I would love to win this. I am always trying to cook healthy and this would give a good way to weigh out portions for dinner, etc. My healthy cooking tip is to replace some fat in baking recipes with applesauce. It really seems to work and makes pumpkin bread and other baked goods more healthy. Also add some wheat germ or bran fiber to such baked goods. Never eat while cooking! You just add fat and calories to your meal! Paulette- good tip! That’s one I have trouble with, for sure! Also, I try to eat on a smaller plate to play tricks on my brain- full plate with less food! It’s silly but it works! I have a husband who grew up as a latchkey kid honing his taste buds on processed foods.. SO, since I don’t want to turn every meal into a battle : ) , when I do make his “old favorites,” I add extras that make it a little healthier. Like last night we had Hamburber Helper and I added peas and mushrooms to the stroganoff, and we had a salad (well, some of us did) and fruit for dessert. Thanks, would love to use this scale esp for making bread ! My healthy cooking tip is to bake/grill what I might have cooked in a more unhealthy fashion otherwise! My tip is to use fresh ingredients instead of boxed or packaged ingredients. My favorite tip is to try and eat more colors.. You will eat way more fruits and vegetables that way! I like to add puree’d veggies to pasta sauces as a way to sneak in extra servings of veggies for my picky kids. my healthy tip is that I use the george foreman grill for everything!! !